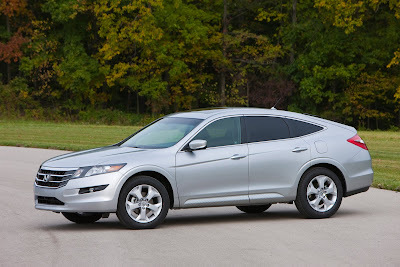 I do not know the reason why Honda decided they needed the Crosstour. I feel confident that the Acura version, the ZDX, was intended as competition for the BMW X6, but for the life of me I see no reason for any of these cars. In some ways the Crosstour reminds me of the old AMC Eagle, an all-wheel-drive sedan that never caught on. The Crosstour is essentially a four-door Accord hatchback. Even though the Crosstour's reason for existing seems to be its versatility, only the top of the line EX-L is available with 4WD, and the only engine available in any Crosstour is a 3.5-liter V6. Honda seems to have lost sight of a simple concept that the late, great Colin Chapman embraced, "Simplicate, then add lightness." The Crosstour is a real porker - at its lightest it weighs 3,852 lbs, and at its heaviest it goes over two tons to 4,070 lbs. The heaviest Accord is only 3,583! The Crosstour is also expensive. The least expensive is just shy of 30-grand and the top of the line 4WD EX-L w/Nav is $36,220. Worse is the poor fuel economy - a best of 27 highway for the 2WD. Remember, the Acura TSX with a higher horsepower version of this engine is rated the same. The 4WD Crosstour is rated at 25 highway and I did not come close to that. I know Honda will sell a fair number of Crosstours but I don't know why. Honda makes other vehicles with 4WD or AWD that have better utility and equal or better fuel economy, and they cost less too.